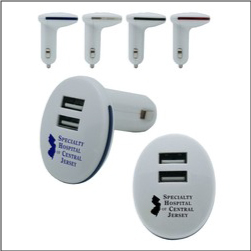 Order Imprinted Custom USB Chargers – chargers come with two device plugins to charge or use two devices simultaneously. Great for Automotive businesses, Travel related businesses, and just about any business or organization with customers who need to recharge a device, phone, etc. Have a trade show coming up? Order your USB charging devices today to handout to attendees!